Every man faces battles. No, not the kind where we have to fight, but real life battles – in our jobs, relationships, marriages, raising children, finances, health issues. Life is full of ’em! When we are fit – emotionally, spiritually and physically – we can overcome all of life’s challenges and find joy in our daily life. That’s what this retreat is all about – getting fit for these battles, and living with peace and joy, exactly as God intended us to live! Join us for our Men’s Retreat on March 22 & 23, 2019. The theme of the retreat is “Fit For Battle” and will be led by Fr. 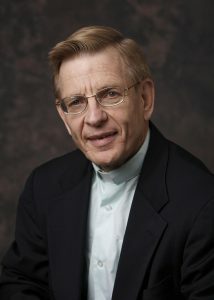 Matthew Linn, SJ. This guy is amazing! He’s a seasoned retreat master, author and spiritual director, and has agreed to inspire the men of St. Patrick for this 2-Day Retreat! The cost is $40 and includes 3 meals along with valuable resources. Please note that this is not an overnight retreat; men will go home on Friday night and return on Saturday morning. Fr. Matt Linn, SJ, engages men in over 50 retreats each year, focusing on spiritual growth, no matter where they are in their faith. He has worked in over 50 countries, authored several books, and provides training in spiritual direction. As a Jesuit priest, his retreat style is rooted in Ignatian spirituality, emphasizing growth in love and life.